Bella, Maia and Nick (From nothing to something to something else, part 1) is a new film commissioned for Groundwork, a season of international contemporary art in Cornwall. With a focus on place and an emphasis on moving image, sound and performance, Groundwork presents new and existing works by internationally acclaimed artists. Manon de Boer is a Dutch artist based in Brussels. Her work has been exhibited internationally, at the Venice Biennale (2007), Berlin Biennale (2008), the São Paulo Bienal (2010) and Documenta 13 (2012) and has also been included in numerous film festivals in Hong Kong, Marseille and Rotterdam. A major exhibition of her work entitled Giving Time to Time was presented at Secession in Vienna in 2016. Manon first visited Cornwall in October 2016. At this time, and during a subsequent visit in March 2017, she sat in on sessions at the International Musicians Seminar (IMS) at Prussia Cove and became increasingly interested in the process of musical communication. After the concentrated intensity of the IMS workshops she was drawn to the idea of spending time with children, asking them to work together to experiment with new sounds and rhythms. 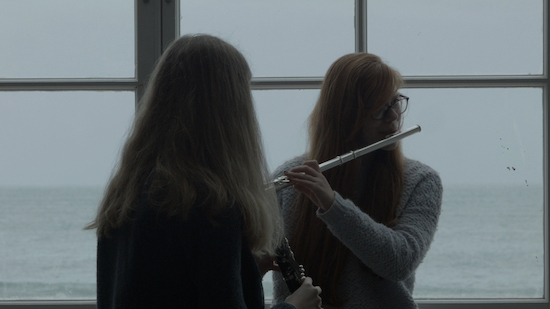 She invited three music students from Helston Community College to come together in February 2018, at Porthmeor Studios in St Ives, to improvise and play. The film takes the names of the three young musicians, Bella, Maia and Nick, as its title. Manon de Boer now sees this as the beginning of a larger project in which she will record groups of children of different ages and in different places, making music for their own pleasure. The title of the longer film will be From nothing to something to something else. The project is a development of her continuing fascination with the way in which open time can provide the conditions for creation. Manon has worked with the Brussels-based production and distribution platform Auguste Orts to realise the film, which has attracted grants from the Mondriaan Fund and from the Elephant Trust in addition to funding from Groundwork, which is supported by Arts Council England.